During my Community work visiting families during the first 3 years, I got to know more and more people in these communities it became clear to me that there were a lot of Children with “Special Needs” in the area, we actually built a small house for two families with kids who had disabilities. I then began to seek out more of these children as they seem to be kept hidden by their families. Memories of Ireland in the 50’s..! I began to take care of some of these kids with Medication and Food, and in some cases we brought them to hospital for attention. Then I brought some to the Cinema for an outing on a few occasions. I then thought , how nice it would be if they had a place to spend some time maybe a few afternoons each week, somewhere they could meet other kids in a similar situation as themselves, somewhere thy could spend time outside of their home which was usually little more then a Hut made from Plastic and bamboo weave sheets. So in May 2008 we were given temporary use of a building which we converted into a small Therapy Centre, with a shower and Toilet, a small Therapy room, a small Kitchen and an Activity room 65 sq, metres in total. We opened with 5 kids and young people – Luis Alberto, Solin, Diego, Vanessa, and Camucha. Since then it has taken on a life of its own and developed to where we are now with more than 50 to 60 children and young people, attending regularly, and another six to eight young people who do not attend regularly buy are still supported by the centre. The Centre is very much owned by the Kids and young people, it has developed as their needs required it to, and we let it develop as the needs demanded.The kids and young people spend two to three, afternoons each week in the centre, doing activities which helps their Disabilities, and having some Physiotherapy, sometimes singing some times dancing even on walking frames…! We take them on outings regularly, to the Zoo, the Beach, and the Water Park in the centre of Lima or on Picnics. The Families have their own support group and they meet on the last Friday of each month, and they have a valuable input into what happens in the Centre, and how it is run. We propose building a further section of the centre in July. In the map below the existing building is coloured Lilac, the section we propose building now is coloured Orange and the final section coloured white will be built as funds permit. This is a breakdown of the main costs of the extension. We already have the funds for the labour, which will be €14,000. We are now looking for funds for the materials. Your donation to some of these materials, however small will be much appreciated. 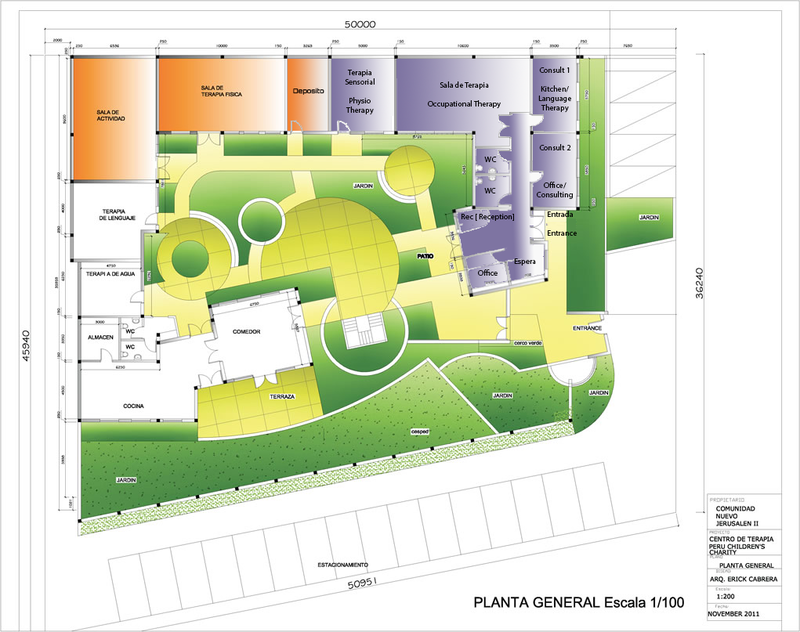 We have constructed and we now operate a Therapy Centre 150 m2, on a Plot of 1500 Sq.M. donated by the local Community. Families of children with disabilities, receive ongoing support in in caring for their child, with workshops on various types of disabilities, how to care for their child, and assistance in improving the living conditions, of the child. Families are helped with the medical needs of the child, hospital visits, and medication. The poorest children in the area receive help with educational needs, books and uniforms etc. If they do not have these essentials they are not permitted entry to the class. The greatest benefit the project may bring to this community is HOPE. Because of the nature of the centres and the support from State bodies in Lima, the project will be self sustaining and utilisation will increase in the future as locals will see the benefits of using the project. The Dining room will be managed by a person paid by a State Organisation in Lima as well as some staff who will operate the Dining Room. This will benefit the poorest families in the area ensuring 120 children receive a nutritious meal daily. The food will be supplied free by this State Organisation. The rest of the expenses for the Dining room will be paid by small contribution from the families who use it. The Crèche will be operated by one staff paid by the Social and Family Department in Lima, and three or more volunteer staff depending on the amount of children who utilise it. Each parent will donate one day per week in return for their children being taken care of in the Crèche. This is run on a cooperative basis by the people benefiting from the Crèche. This enables the women to go out and work five days per week and give one day to the Crèche. This will also help break the cycle of poverty in the area. The children will also benefit socially from the Crèche as previously the children would have remained at home in poor housing conditions. The After School Club will benefit older children attending national school. It also enables the parent to work as her child will receive a meal and will be supervised in the After School Club until the evening. The supervisor will be paid for by the local Municipality. The supervisor will also help with the homework. It is hugely important to ensure that homework is completed on a daily basis otherwise the child may loose their place in the school therefore the child will have no education and the cycle of poverty continues. In the present situation some of these young children look after younger siblings while the parent is at work. The General Community will also use the facilities for Meetings and educational purposes, such as courses in craft work, life skills, parenting skills and adult education for young adults who never went to school for different reasons. These courses are provided free of charge by a variety of Organisations and State Bodies as long as there are suitable facilities to hold them in.